If you've setup Enterprise Voice with Lync, you will often have to use some sort of media gateway to connect your Lync infrastructure to the PSTN (unless you're using a direct SIP provider, of course). One of my favourite media gateways is the Dialogic DMG 2000. It's extremely flexible and easy to setup. I've been on more than a few deployments that used Dialogic gateways, and I'm constantly amazed at how quickly you can be up and running. I usually tell the customer it may take an entire day to get it working right, but its always taken less than an hour from plugging it in to full inbound/outbound Lync PSTN calling. This post isn't about how to setup a Dialogic to work with Lync. Dialogic already has all the documentation (even a sample configuration file) to get you going in that respect. I'm assuming you've already gotten Lync working with a Dialogic and you've got the latest firmware revision. UPDATE (21-Sept-2011) - It appears that the www.dialogic.com/microsoftuc site is not working. The documentation and sample config.ini used to be located at http://www.dialogic.com/microsoftuc/DMG2000_Lync_Config.zip. The documentation can be viewed at Scribd via http://www.scribd.com/doc/58959088/Lync-DMG2000-Setup-1. Once things are running, you may encounter some rather odd issues that could leave you scratching your head. Here are a few of my experiences and how I resolved them. Keep in mind that while the solutions worked for my client, it may not work for yours. Also, make sure you backup your current configuration, so you can revert back to it should any of the changes you made break things. Several people have noted that calls from the PSTN that are transferred internally twice fail after 30 seconds. I've personally seen this where someone calls the central response group, which then transfers to an Exchange Auto Attendant after a set period. If that person then transfers to a user, the phone just rings and rings and never goes to voicemail. I've seen several posts on the Dialogic forums that had this happen when both Media Bypass and Refer support were enabled (which should be supported in a Dialogic). Turning off either (or both) allows calls to work as expected. A interim firmware fix has been released by Dialogic to fix this problem and should be fixed permanently in the SU8 firmware which should be out by the end of July. This thread on the Dialogic forum explains the issue and provides a link (in a post near the bottom). Once in a while, a user would be on a PSTN call via Lync and their call would suddenly disconnect for no apparent reason. Using the very helpful call log in the Dialogic, I could see the End Reason was "TDM: Dialtone detected." The Dialogic DMG 2000 will listen for the presence of any number of tones (busy, ringing, dialtone etc) and act accordingly. 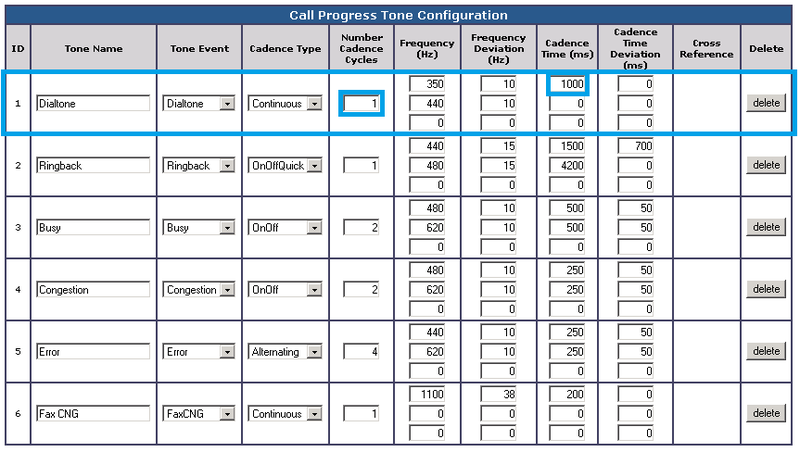 You can see the current list of tones by clicking on Configuration - Tone Detection. You should see an entry for Dial Tone. Presumably, the Dialogic will disconnect an in-progress call when a dialtone is heard. A quick chat with the user showed that they never heard any kind of dial tone during their call that would cause the call disconnect. Initially, I changed the number of Cadence Cycles and the Cadence Time to higher values to decrease the chances invalid dialtone detection. However, the problem still cropped up from time to time, so I ended up deleting the entire Dialtone entry. This particularly odd issue only happened when you called a phone number that went to voicemail. Users would notice that they would hear the voicemail pick up, but they would either hear no audio, or only a second of audio before going silent. The call wouldn't disconnect until the user hung up. If the user called back and someone picked up, the call would work properly. Also, if they used their cell phone and got voicemail, the call would work properly. It didn't happen with every number, but if you did get the issue with a particular phone number, you would always have the issue (which made troubleshooting easier). 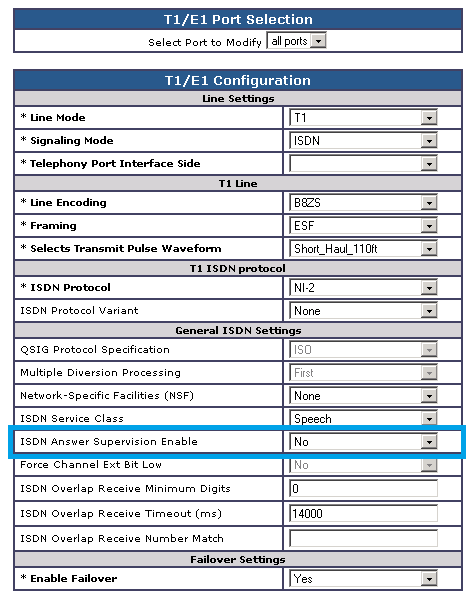 The solution was to change ISDN Answer Supervision Enable (under Configuration - TDM - T1/E1) to No. When this option is set to Yes, the Dialogic will use ISDN codes to determine if a call is answered. For whatever reason, this didn't work for some phone numbers when the call went to voicemail. Turning it off forces the Dialogic to listen for a network connection. Clive Graven at Microsoft gave me a list of issues/fixes he's encountered during his travels. I haven't seen these issues myself, but if they sound familiar to you, it might help you out. Clive saw this when a client was talking to someone over the PSTN for at least 30 seconds who then invited someone else into the conversation (which triggers a switch to a conference). The call would be disconnected. He fixed it by changing the TCP Inactivity Timer (under Configuration - VoIP - General) to 120 seconds (default 90). If users complain about their telephone calls sounding "echo-y" or "sounds like I'm calling from a bathroom" (either from their perspective or the person on the other end), you can edit some of the DSP Advanced Settings under Configuration - DSP Settings. Before making any changes here, make sure everyone is having the issue. If it's only affecting a few people, focus on their device. Echoing might actually be audio clipping resulting from the incoming or outgoing signal being too high. 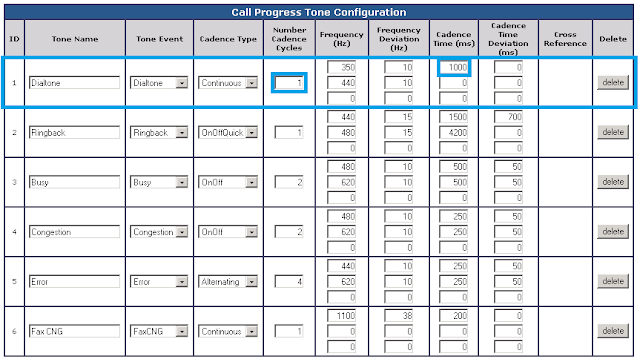 You can verify this by capturing the call audio using the Dialogic diagnostics logging (under Diagnostics - Trace/Logging - TDM Capture) and analyzing it in a sound editor. You can try reducing the audio gain by modifying either TDM to IP Gain Adjustment or IP to TDM Gain Adjustment as appropriate. Use negative values to reduce the overall volume, and positive to increase it. All the issues noted above are really just the result of slight differences between PSTN providers, rather than a problem with either Lync or the Dialogic device. Dialogic does an admirable job of providing defaults that work 99.9% of the time. If you have anything else to add to the list, please drop me a note in the Comments section. Like I said this isn't an issue everywhere but if you experience it this should be the fix. Nice article Ken. I'm partial to AudioCodes Mediant 1000's and have done many deployments with these units and found them to work very well. Voice quality is excellent out of the box and I've never had to modify the voice defaults. Ken, do you know if the DMG2000 supports SIP REFER? PSTN transfers are failing when I have Media Bypass enabled and I can't find a reference to it anywhere in the DMG GUI or config.ini. It does support SIP REFER. I've got it enabled at a few customers with Media Bypass and they're not seeing the issue that you and a bunch of others are having. I'll have to have a think to see if there was something I did to make it work. can you help me as i am using inin dialer 3.0 and facing the call disconnected issue. we recevied rendomely around above 40 to 50 calls which does not have the voice. what are the case could be for balnk calls for outgoign from the dialer. would appricate for quick responce..
We have Exchange UM deployed with Lync and when a caller goes to an AutoAttendant and tries to transfer to an extension the call is dropped and we get a warning in the Exchange UM log about an error during transfer, if we disable Media Bypass the error goes away and the call works. Any idea? I work for a very small (10 people) software company and they have me installing Lync. I ordered a DMG1000 and we have it set up directly to the PSTN with no PBX. I cant get outbound calls to work for the life of me and I've been working on it for over 3 days now! Where can I find this Dialogic documentation or the sampel config file? Would be MUCH appreciated! It seems as though the sample config and Lync config document that was normally available via http://www.dialogic.com/microsoftuc/DMG2000_Lync_Config.zip is no longer available. Not sure why. I found the Lync config doc via scribd (http://www.scribd.com/doc/58959088/Lync-DMG2000-Setup-1), but no sample config.ini. That is for the DMG2000 and we have a 1000. I am already seeing differences reading through it. Some things were the same, though, and I made changes where I could, but I am still getting the same problems. In Lync Logger/snooper I see SIP/2.0 400 Bad Requests and SIP/2.0 409 Conflict on both in and out. In the DMG1000 Call log I see TDM: Conflict and VoIP: Transport Failure. Interestingly, I have everything set up for TCP, but in Lync Logger/snooper it says transport=tls under Record Route and under Via: it says SIP/2.0/TLS. Why is it still saying TLS? I should mention since I made this post I have got the Lync Logger/snooper messages to say transport=tcp, however I am still seeing the message "CONNECTION: TLS negotiation started" despite having TLS disabled on both the Lync side and the gateway side. This has also caused me to get a bunch of new warnings and errors in the traces and a new 504 server time-out error in the messages. Monitor Call Connections under VoIP - General. Great post Ken, I am just wondering if the details of echo applies to our issues. Lync Standard 2010, DMG1008LSW combo. When calling some companies and leaving a message on their own voice mail, some locations start echoing back as I am talking. This doesnt happen talking to actual people at those sites only when we are leaving a voicemail recording for them. I tested it today and it happened both with my blue tooth headset and with a Polycom VOIP handset.Our phone lines our POTS attached to the gateway. Any suggestions? I don't have the sample config.ini for the Dialogic any longer. As you are partial to Mediant, do you have a similar post for Mediant 1000 troubleshooting? I have an issue where when a users number is dialed, say from a cell phone or 3rd party land line, the caller hears ringing, followed by another dial tone (2 dial tones essentially). On the 2nd dial tone, if the number is dialed again, it connects to the Lync user (or similarly, any 3 digit extension or other number in the Lync system) and sucessfully rings the Lync user and the call completes without issue. Any advice? Sadly, I don't have a similar post for the Audiocodes Mediant 1000, and don't have any advice for your issue.